Having sailed half way to the region of Albany a ‘rebel’ army captured New York from the Iroquis Confederacy and set up a new civilisation as the USA. I now had two choices; I could change my destination to another region and develop my relationship with America to create a powerful ally or destroy them now. Whilst the idea of having another ally in the Americas was tempting I considered that as had happened in our history we would eventually have to come up against one another. To that end I sent my ship on its way and landed my army in New York and besieged Albany. Not wanting to defend against them trying to break the siege I decided to attack them straight away and catch them at their weakest. Unfortunately I hadn’t, until I clicked the attack button, taken into account the local militia that would be joining the battle…ahh. This now slightly tipped the initial percentage of power into their hands but what they hadn’t taken into account was my superior training and tactics. Deploying my army as near to the unfortified town as possible I started the battle only to realise they were out of range of my cannon fire. Previously when you attacked an enemy force they would stay put and let you come to them however this time they started moving round with the AI showing much higher levels of intelligence. They sent a unit of Colonial Militia to the right of me and once in range my 12-lber Foot Artillery started shelling their troops. Due to them constantly moving in between buildings this unfortunately had very little effect on them. Leaving 2 companies of Colonial Militia and the General and his bodyguard the USA’s main body of men started circling to the left of me. It would appear they would bring the fight to me and had hoped that by sending a small but untrained company of Militia to the right it would distract me long enough to circle to the left and take me out. Thankfully I spotted their dirty tactics early on in their deployment and sent two companies of my Colonial Line Infantry to fend off the Militia coming to the right with ease. My artillery was now ineffective against that company and with the main body of men from the USA coming into range to the left I switched the fire to them. Tactically I had deployed my artillery in a walled field and so had some cover against the approaching forces. I lined up two companies of Infantry and sent my company of Pikemen to finish off the remaining Militia to the right and replace my Infantry there. With the main body of enemy troops on me I circled my General’s Cavalry and Colonial Dragoons round the back of my engaged troops and smashed into the right hand side of the enemy. The Pikemen had finished off the Militia and so I ordered them into the fray. Without bayonets my troops wouldn’t be as effective in melee as I would have liked but non the less I ordered them to fight hand to hand with the enemy to overwhelm them. Unfortunately although these were just Militia I was fighting they managed to take down my General and his bodyguards. He died a hero and in doing so it signalled it was time for me to re-assess my current situation and develop the next stage to the battle. With the town to the rear of my army I pulled them all back up the slope. Putting a company of Infantry in a building I set up my other two companies of Infantry either side and facing down the hill. I gambled that the 3 companies of enemy Militia left behind by the enemy on the other side of the town would stay where they were and it, thankfully, paid off. With the enemy coming at me I held my ground and with my troops superior shooting skills held them off. A few units by now had run away and others were whittled down to small numbers. Seeing the chance I ordered my men further up into the town to base myself round another two buildings I could occupy. Putting one company of Infantry in one building facing south down the slope and another in the building facing to the east and out towards the 3 enemy companies I was safe. Ordering one company of Infantry to the left of the southern building and dismounting my Dragoons to assist if required we held off the final attack from the enemy coming from the south. They had all scattered and now it was time to prepare to take the fight to the last of the enemy. They had positioned their two remaining companies of Militia side by side 3 men deep on the other side of the field with their General and his bodyguard just behind them. I lined up my 3 companies of Infantry and started forward. Moving the remains of my artillery crew and Pikemen up the left hand side of the field with the intention of charging them into the sides of the Militia or having the Pikemen dealing with their General. With the remainder of my General’s bodyguard and Dragoons closely following behind my Pikemen and Militia it appeared I had the tactics well thought out. Alas, for some unknown reason my Dragoons took off a short distance from the enemy. This was no problem as I still had the upper hand in both men and quality. Once in range my three companies of Infantry opened fire on the two enemy companies of Militia and whilst engaged I ordered the rest of my foot soldiers to attack the left hand company of enemy Militia. My General’s bodyguard engaged with the enemy General’s bodyguard. So as to not cause friendly fire incidents I ordered all three companies of Infantry into the fray with bayonets fixed in bloody hand to hand combat. My General’s bodyguard seemed to be suffering against the enemy General’s but considering the fewer numbers and the lack of General this was somewhat understandable against an untouched body of men and horses. 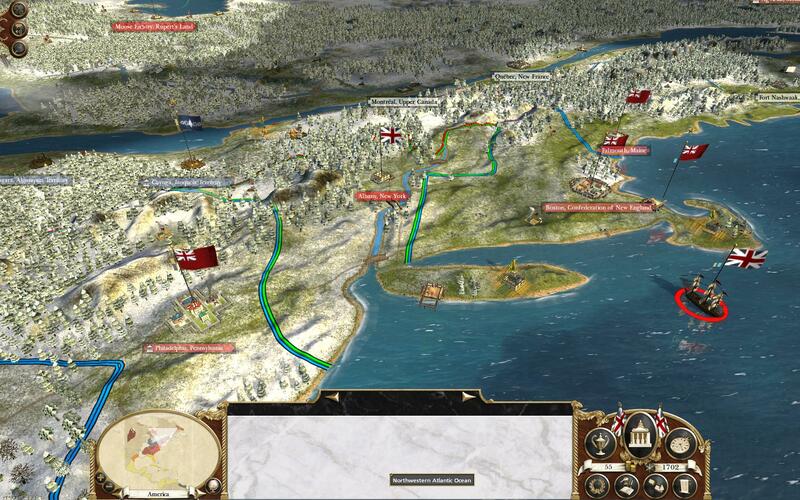 To this end I diverted my Pikemen away from the enemy Militia and ordered them to attack the enemy General. With my men overwhelming the enemy in greater numbers I was soon winning and with the enemy General dead and his bodyguards fleeing it wasn’t long before the rest of the enemy followed suit, turned tails and fled. I won the battle and although I lost more men than I had originally thought I would and intended to lose I feel this was a great victory for me. My General had died protecting the future of the British Empire and he would not be forgotten in the years to come. With the Iroquis Confederacy to the left of me and being surrounded by the Thirteen Colonies I can be safe in the knowledge that I will use this as a base to launch an attack on the American Indian tribes and spread my dominance over the Americas. The future is looking bright for the British Empire and with me yet to land on Indian soil there are already great signs of future expansion.